Cook up a homemade creamy vegetable soup in just over 30 minutes. 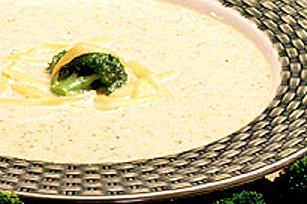 Served with crusty rolls and a side salad, this broccoli-cheddar soup is a comfort food classic. COOK vegetables (reserve 6 flowerettes of broccoli) in broth and water until tender. Let cool 10 minutes. POUR into blender. Process until smooth; return to saucepan. WHISK in Miracle Whip and cheese. Heat over low heat to melt cheese. DO NOT BOIL. Garnish with broccoli. Reserve 6 flowerettes for garnish.